احمدی راد, حدیث, حسینی, فرزانه, حاجی زاده, محمدرضا, خوشدل, علیرضا, رضائیان, محسن, آدینه پور, امیر, محمودی, مهدی. (1396). تاًثیر مصرف پودر پسته وحشی بر تعدادی از متابولیت‌های بیوشیمیایی خون در افراد هایپرلیپیدمیک: یک مطالعه کارآزمایی بالینی دو سو کور. سلامت جامعه, 9(2), 29-37. 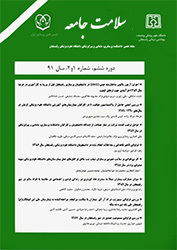 حدیث احمدی راد; فرزانه حسینی; محمدرضا حاجی زاده; علیرضا خوشدل; محسن رضائیان; امیر آدینه پور; مهدی محمودی. "تاًثیر مصرف پودر پسته وحشی بر تعدادی از متابولیت‌های بیوشیمیایی خون در افراد هایپرلیپیدمیک: یک مطالعه کارآزمایی بالینی دو سو کور". سلامت جامعه, 9, 2, 1396, 29-37. احمدی راد, حدیث, حسینی, فرزانه, حاجی زاده, محمدرضا, خوشدل, علیرضا, رضائیان, محسن, آدینه پور, امیر, محمودی, مهدی. (1396). 'تاًثیر مصرف پودر پسته وحشی بر تعدادی از متابولیت‌های بیوشیمیایی خون در افراد هایپرلیپیدمیک: یک مطالعه کارآزمایی بالینی دو سو کور', سلامت جامعه, 9(2), pp. 29-37. احمدی راد, حدیث, حسینی, فرزانه, حاجی زاده, محمدرضا, خوشدل, علیرضا, رضائیان, محسن, آدینه پور, امیر, محمودی, مهدی. تاًثیر مصرف پودر پسته وحشی بر تعدادی از متابولیت‌های بیوشیمیایی خون در افراد هایپرلیپیدمیک: یک مطالعه کارآزمایی بالینی دو سو کور. سلامت جامعه, 1396; 9(2): 29-37. مقدمه: افزایش چربی خون یکی از عوامل مؤثر در ایجاد بیماری­های قلبی - عروقی است. یکی از راه­های کاهش عوارض این بیماری، استفاده از گیاهان دارویی است. بر همین اساس، هدف از این مطالعه بررسی اثر پسته وحشی(بنه) بر لیپیدها و برخی فاکتورهای بیوشیمیایی در نمونه­های انسانی هایپرلیپیدمیک بود. مواد و روش­ ها: این مطالعه کارآزمایی بالینی دوسوکور، بر روی60 نفر از افراد هایپرلیپیدمیک با تری­گلیسرید بالای mg/dl200 و کلسترول بالای mg/dl 245 انجام گردید. 30 نفر از آنها به صورت تصادفی 5/2 گرم و 30 نفر بعدی 5 گرم پودر بنه دریافت کردند. قبل از شروع مطالعه، از هر دو گروه نمونه خون به صورت ناشتا گرفته شد و سپس به افراد بسته­های مورد نظر برای مصرف روزانه به مدت دو ماه داده شد. بعد از مصرف مجدداً نمونه خون ناشتا از افراد تهیه گردید. نتایج با استفاده از آزمون­های تی مستقل و تی زوج تجزیه و تحلیل گردید. یافته­ ها: در هر دو گروه میزان تری­گلیسرید، کلسترول و LDL به صورت معنی­دار کاهش و میزان HDL نیز به صورت معنی­داری افزایش یافت و در مورد سایر فاکتورها بین دو گروه تفاوت معنی­داری وجود نداشت. نتیجه­ گیری: نتایج نشان داد مصرف پودر پسته وحشی می­تواند میزان تری­گلیسرید، کلسترول و LDL را کاهش و HDL را افزایش دهد. بنابراین، احتمالاً پسته وحشی می­تواند در افراد با هایپرلیپدمی خفیف مفید باشد. 2Assistant Prof, Dept. of Clinical Biochemistry, Faculty of Medicine and Molecular Medicine Research Center, Rafsanjan University of Medical Sciences, Rafsanjan, Iran. 3Prof, Dept of Epidemiology and Biostatistics, Faculty of Medicine, University of Medical Sciences, Rafsanjan, Iran. 5Prof. of Clinical Biochemistry, Molecular Medicine Research Center and Dept. of Clinical Biochemistry, Faculty of Medicine, and, Rafsanjan University of Medical Sciences, Rafsanjan, Iran. Introduction: Hyperlipidemia is one of the factors contributing to cardiovascular disease (CVD). One way of reducing the complications of this disease is the use of medicinal plants. Accordingly, the aim of this study was to evaluate the effect of Pistacia atlantica powder consumption on lipids and other biochemical factors in hyperlipidemic individuals. Results: Blood triglycerides, cholesterol and LDL-C decreased significantly but the level of HDL-C increased significantly in both groups. There was no significant difference between the two groups based on the other factors. Conclusion: According to the results of the present study, pistacia powder consumption can decrease triglyceride, cholesterol, LDL and increase HDL levels, therefore the pistacia atlantica can be useful for individuals with mild hyperlipidemia. Wirztum J, Steinberg D. The hyperlipoprotenemia. Goldman L, Bennett JC cecil text book of medicine. 21st ed. Philadelphia: WB Saunders; 2000:1090. Álvarez R, Encina A, Hidalgo NP. Pistacia terebinthus L. leaflets: an anatomical study. Plant Systematics and Evolution 2008;272(1-4):107-18. Mukuddem-Petersen J, Oosthuizen W, Jerling JC. A systematic review of the effects of nuts on blood lipid profiles in humans. The Journal of nutrition 2005;135(9):2082-9. Martinez J-J. Impact of a gall-inducing aphid on Pistacia atlantica Desf. trees. Arthropod-Plant Interactions 2008;2(3):147-51. Hamdan I, Afifi F. Studies on the in vitro and in vivo hypoglycemic activities of some medicinal plants used in treatment of diabetes in Jordanian traditional medicine. Journal of ethnopharmacology 2004;93(1):117-21. Mahmoodi M, Zijoud SH, Hassanshahi G, Toghroli M, Khaksari M, Hajizadeh M, et al. The effects of consumption of raw garlic on serum lipid level, blood sugar and a number of effective hormones on lipid and sugar metabolism in hyperglycemic and/or hyperlipidemic individuals——Benefit of raw garlic consumption. Advances in Biological Chemistry 2011;1(02):29-33. Sabate J, Fraser GE, Burke K, Knutsen SF, Bennett H, Lindsted KD. Effects of walnuts on serum lipid levels and blood pressure in normal men. New England Journal of Medicine 1993;328(9):603-7. Hsu S-C, Huang C-j. Changes in liver PPARα mRNA expression in response to two levels of high-safflower-oil diets correlate with changes in adiposity and serum leptin in rats and mice. The Journal of nutritional biochemistry 2007;18(2):86-96.